This New Tip-up line is ideal for precise bait placement while tip-up fishing. Made with a powerful heat-set nylon, this braid changes colors every 5 feet. Metered in 5 foot segments for precision depth management. This allows ice anglers to set their baits at a precise depth and then duplicate productive depth patterns. The metered black and tan colors are top choices of ice anglers and more subtle than the stark white and black lines out there currently. Made from Hi tenacity nylon for increased breaking strength and abrasion resistance. 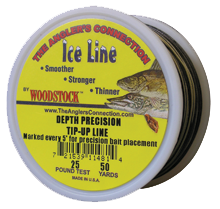 Depth Precision Tip-up Line is also made in the USA and costs less than others.